Dr. Ahmed is a computer scientist with research interest in distributed sensing systems with unreliable sensors. Her passion has driven her to work on social problems that has led to interesting Human Computer Interaction (HCI) research projects. She pursued her MS at Georgia State University and doctoral degree from Georgia Institute of Technology. She served as a Research Scientist at Georgia Tech Research Institute (GTRI) for a year. After that, Dr. Ahmed came back to Bangladesh to serve the country. 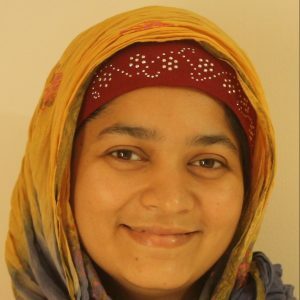 She received her bachelor’s degree in Computer Science from University of Dhaka, where she also served as a faculty member after graduation. Dr. Ahmed is currently an Associate Professor at North South University, Dhaka, Bangladesh. She enjoys playing with her daughters Anuva and Arisha in her leisure time!